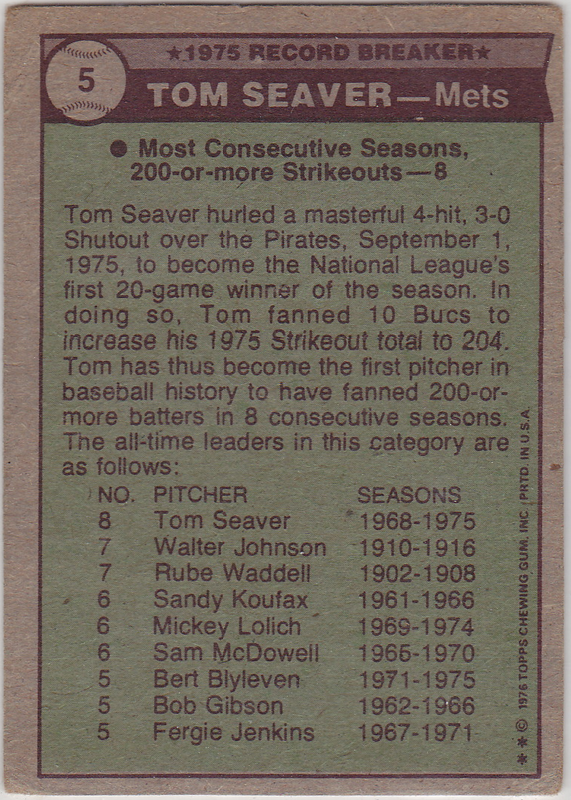 Topps used their number five slot to mark strikeout records in both 1975 and 1976, first Nolan Ryan's three-season 300K streak (1975 set profile), and then for Seaver's eight-season 200K streak. I don't know quite what to think about this card. 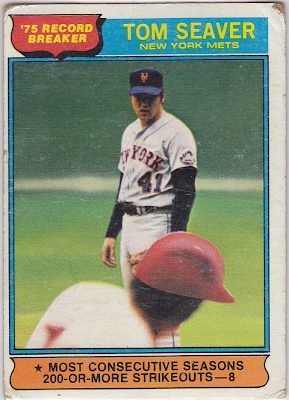 Topps started with a presentable (if static) photo of Seaver looking in for a sign and then couldn't decide what to do with the nebulous foreground player. Airbrush away his blurry edges? Replace his batting helmet with an upside-down gravy boat? Some of both? Sometime at Topps liked this picture, because it resurfaced for their 2008 Stadium Club set. This version's a big step up in quality, both for Seaver's clarity (no face shadows) and the batter's more consistent blur (if that's not an oxymoron). The photo finally comes across in a way 1976 card production technology couldn't deliver. 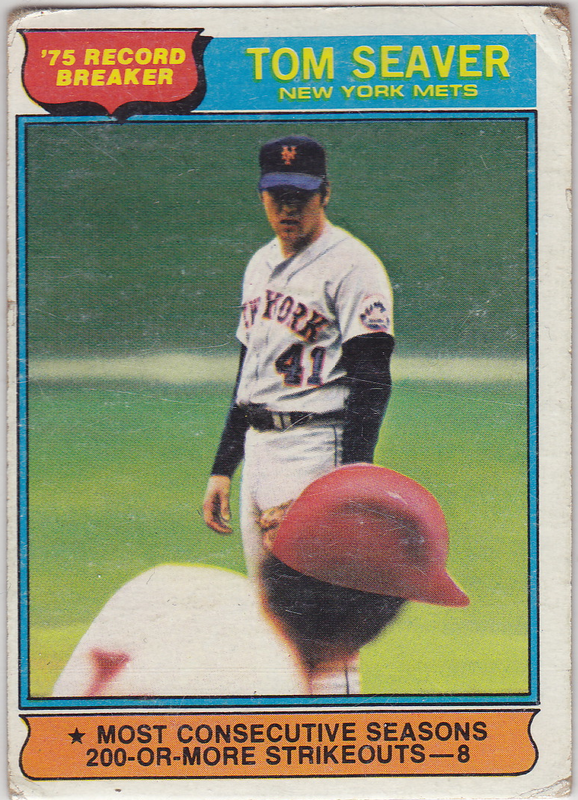 Seaver and Blyleven ran their respective streaks to nine and six in 1976, before falling short of 200 in 1977. 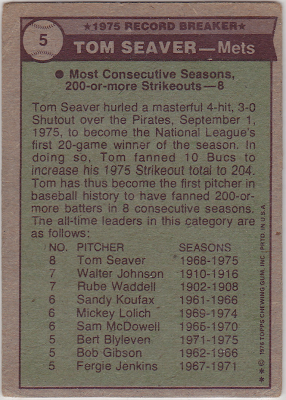 Note that most of the pitchers on that card played during the 60s and 70s, a high-point for moundsmen dominance; only a dozen or so clear 200Ks these days and rarely string together consecutive years. Anyone you think can make 6 in a row in today's game? My vote's for Felix Hernandez, who's sitting at three (2009-11) and looks as sturdy as ever. 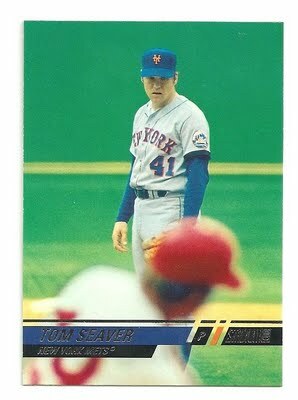 Fakes / reprints: Don't know of reprints other than Seaver reappearing in Stadium Club.